Congratulations to Ehab Essa, who today, successfully defended his PhD thesis: Combinatorial Optimisation for Medical Image Segmentation. Jason Xie was the supervisor, the internal examiner was Raoul van Loon, the external examiner was Yonghuai Liu (Aberystwyth) and Rita Borgo was the viva chair. This entry was posted in PhD Viva and tagged Computer Vision on May 8, 2014 by Mark. In this work, we investigate whether it is possible to distinguish conversational interac- tions from observing human motion alone, in particular subject specific gestures in 3D. We adopt Kinect sensors to obtain 3D displacement and velocity measurements, followed by wavelet decomposition to extract low level temporal features. These features are then generalized to form a visual vocabulary that can be further generalized to a set of topics from temporal distributions of visual vocabulary. 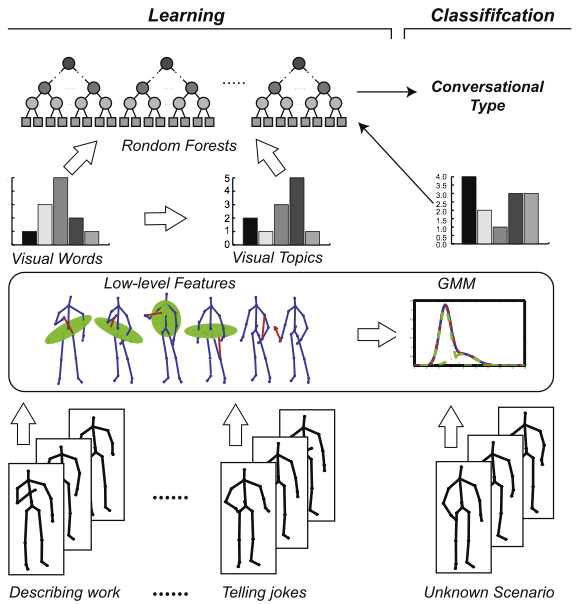 A subject specific supervised learning approach based on Random Forests is used to classify the testing sequences to seven dif- ferent conversational scenarios. These conversational scenarios concerned in this work have rather subtle differences among them. Unlike typical action or event recognition, each interaction in our case contain many instances of primitive motions and actions, many of which are shared among different conversation scenarios. That is the interactions we are concerned with are not micro or instant events, such as hugging and high-five, but rather interactions over a period of time that consists rather similar individual motions, micro actions and interactions. We believe this is among one of the first work that is devoted to subject specific conversational interaction classification using 3D pose features and to show this task is indeed possible. 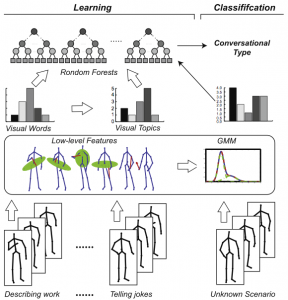 J. Deng, X. Xie, and B. Daubney, A bag of words approach to subject specific 3D human pose interaction classification with random decision forests, Graphical Models, Volume 76, Issue 3, Pages 162–171, May 2014. More details can be found at the Swansea Vision website. This entry was posted in Publication, Uncategorized and tagged Computer Vision, Journal paper on May 1, 2014 by Xianghua Xie.